Jace Gan is based in Colliers International’s Orange County office. He specializes in the sale and leasing of “big box” industrial projects in the Greater Los Angeles and Orange County markets. Jace joined Colliers International in 2015 as an associate to work with one of the firm’s top industrial teams headed by Clyde Stauff, senior executive vice president. In this role, Jace spearheads business development for Clyde’s team. He makes the first contact with the client and introduces them to Colliers International’s global brokerage, marketing and research capabilities, which are leveraged at a local level. Working with both national and local tenants and landlords, Jace is responsible for identifying business development opportunities, as well as providing up-to-the-minute market information. Bachelor of Science Degree in Business with an emphasis in finance. Working out of the Orange County office, Clyde Stauff specializes in the sales and leasing of industrial facilities throughout Southern California. 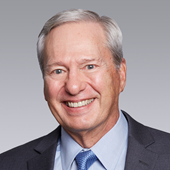 Clyde began his career with Colliers International (The Seeley Company) in 1973. In 1978, he opened the Colliers Seeley International, Inc. North Orange County office and was elected to partnership in the firm. He served on Colliers Seeley International Board of Directors for more than seven years. Clyde’s personal sales and leasing volume has consistently averaged in excess of $300,000,000. His sales experience includes transactions involving land development, representation of users, developers and investors in all major markets throughout Southern California. Clyde’s analytical skills include development planning, lease and investment analysis, and disposition strategies. Representative clients include Golden Springs Development Company, The Irvine Company, The Koll Company, Sares-Regis Group, Industrial Income Trust, Invesco, Goodrich, RockTenn Corp., Overton Moore Properties, Raytheon and Mercedes-Benz.